A fun day trip if you're near Canandaigua, NY is a visit to the Sonnenberg Gardens. My favorite gardens were the rock gardens, the "old-fashioned," and the Japanese. We started at the rock garden. that's a massive hydrangea vine growing up the side of the stairs! the osage oranges were incredible! The entrance to the rose garden... not much to see in late August. I just didn't take any pictures of the interior! All in all, a lovely way to spend an afternoon if you're in the Finger Lakes! I have never seen a pesto that was so silky or so... verdant... so... light green. has won top honors at the Genova World Pesto Competition. So, if I did nothing else this summer I knew I had to try making it...! First you pop your blender in the freezer. (the recipe calls for glass, which luckily we have). Prep 6 loosely packed cups of basil leaves. You soak it in cold water. and lifting the basil up gently by hand at each change-out. Then you soak the basil the last time for 15 minutes in cold water. NOT the Chinese ones... read up on "pine nut mouth" and "pine nut syndrome"
and you'll be happy to pay more per pound). Lucky us, we even have a local salt around here...! This is mined from salt veins deep beneath Seneca Lake. Lift a handful of basil, shake off excess water and place it in your blender. but I found that my blender just didn't cut it for this. It wasn't incorporating the basil well at all, so I had to blend much longer. After you've incorporated all of the basil, then it's time for the cheese. so I went with a nice grana padano from our local Wegmans. Puree just enough to combine. Making the pesto made me want pasta right away. I had never had chitarra, and it really turned out to be a GREAT companion to the pesto. Chitarra is sort of like a square spaghetti. It's got a bit more substance. that it looks like an heirloom musical instrument. al dente, it was gorgeously chewy and a total pleasure to eat. and the key seems to be at least somewhat in the pasta process. you will toss your pasta in. Whisk it with your pesto and it becomes really luscious. but whatever, I'm not complaining. I think I get it, too. But I don't think that what they're expressing is about being Pollyanna. or that we should pretend that it is. whenever anything isn't going as he'd like it to. It's that whole "when life give you lemons, make lemonade" business. but it's what we've got. I've been there. I certainly won't argue with that. Maybe we have to do something we've been dreading. get through the day, and maybe that is the gift. and a whole lot of things to be grateful about. and feel it to be true. to make it be true. 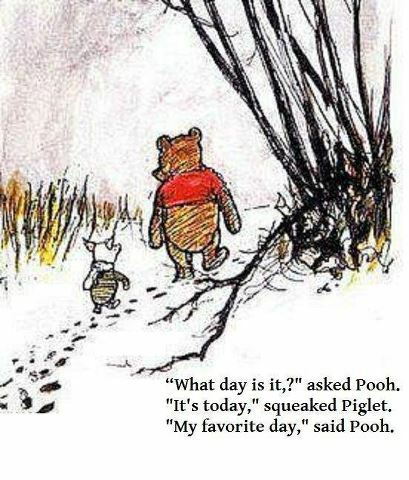 I will simply say that I hope today is your favorite day. And the next today and the next one after that, too.